yes Cagalli is one my favs! But do you think her expression is so sad? Cagalli is beautiful and has a cute expression^^ +FAV! Thanks for sharing this nice scan. Cagalli looks so thin here but very sweet and feminine. Loved the lilac shade and the melancholic eyes! love that lavender shirt and of course Cagalli too! Cags looks great in this shirt. Love the expression. (10/10). Everything looks great about Cagalli-sama. This type of clothes really suits her and the colors are just dazzling. She looks so pretty here, despite the sad smile. Still, great scan. You are right! 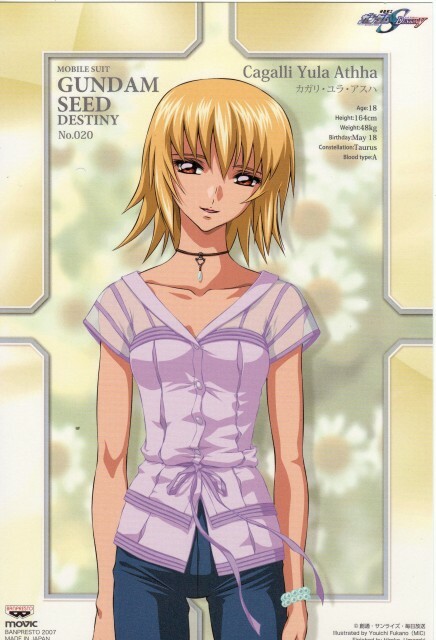 Cagalli n Athrun wear clothes with d same color. I really like that! Unlike d other couples. Athrun must be on Cagalli's side! Too bad there's no Auel, Rey n Stellar's pic in this special. Btw, where did u get this GSD Special? I really want to know! Please tell me! I agree with ya "thaikuching"! Athrun and Cags are totally the only couples that are in unison of colors and expressionional looks. I am soooo wondering where the heck you found all these pics! I only found really teeny ones. Cagalli looks pretty. This clothes is nice styles. Beautiful scan. Thank for sharing.